The GPS receiver is today's choice among navigators, travelers, geocachers, waymarkers, mariners, hikers and more. But what about the days before the GPS was around? How were they able to find their way in the open oceans, dense forests, and desolate deserts? And better yet, so accurately and efficiently? The answer is through the use of hand held devices much like the GPS receiver, but using more natural reference points. 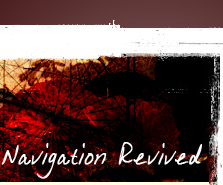 The Navigation Coin™ series revitalizes and pays tribute to the use of those antiquated devices which the GPS receiver made obsolete. Some of these coins provide a little history behind the devices used, and others are actual working replicas which can provide you with your approximate location. 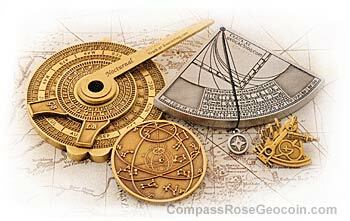 Each coin has a story to tell; each coin represents several centuries worth of navigational development for mankind. Try them out yourself and see what they were like to use. 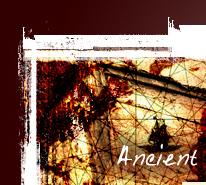 Develop some of the skills which helped our ancestors discover the lands we now live on. Even though these coins are much smaller than their real representations and do not give as precise of a measurement as the full size instruments, they can still give you a feel of their real use. While using these coins, imagine you are at sea; the ocean swells are a meager 15 feet high, and you are on a small ship the size of a semi-truck. Then try to hold the instrument steady and gain an accurate reading. Not as easy as some people might have thought. 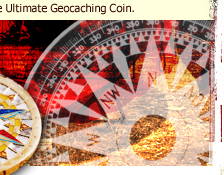 As an added bonus, each coin is trackable on Geocaching.com . You can sign up for a free account and log each coin under your Geocaching.com profile. You can then record its travels as you navigate from place to place. 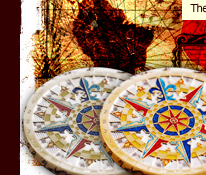 Visit CoinsAndPins.com to find information on purchasing the Navigation Coins™.